Today I bring you a page that once again is a challenge entry (seems to be all I'm doing these days, damn inspiring challenges!) but not a sketch challenge. 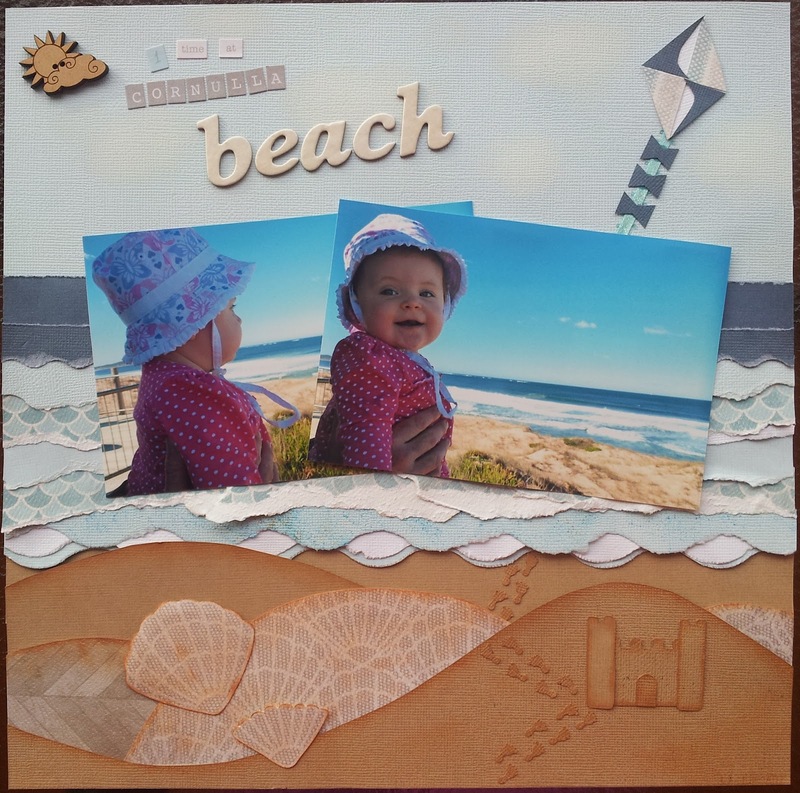 This challenge is from a favourite of mine, Scrapville. While I was on my little break back in my country home town, a dropped by the Scrapville store and picked up a 'Monthly Pack'. As the name suggests, each month the lovely ladies put together a pack of scraping goodies for you to create anything with. 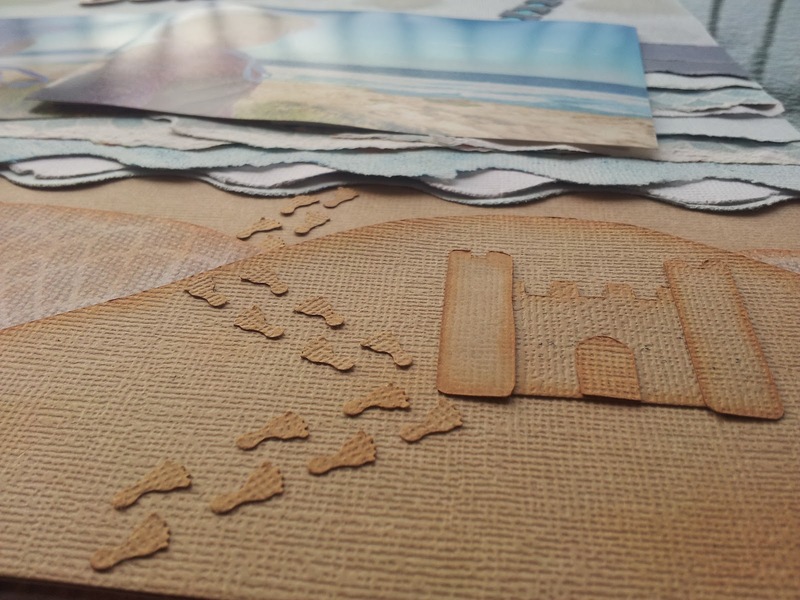 And if you can make something using only what is in the pack (exception of ink, misting and large alpha) email it in and best piece wins the next pack free! Yepee! 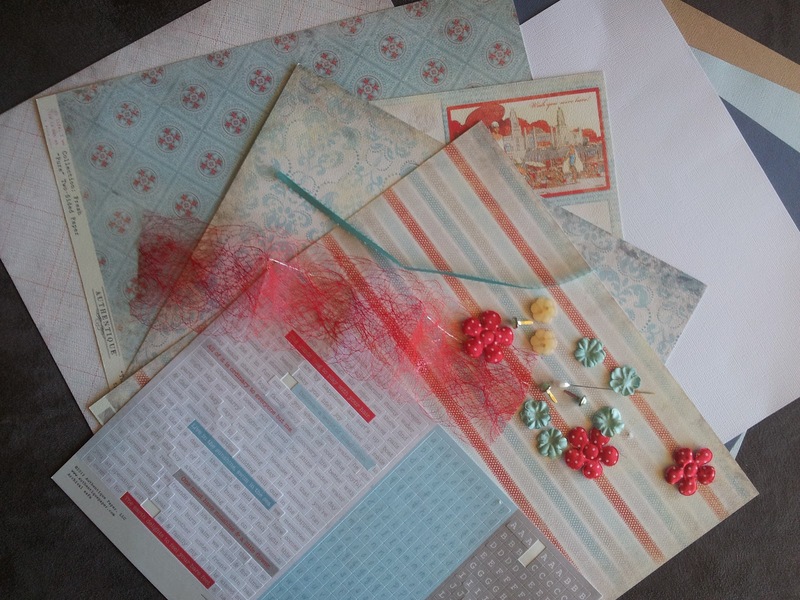 This paper features 5 fantastic double sided papers from Authentique, 4 cardstock papers, Authentique alpha sticker sheet, 3 brads, 2 buttons, chipboard bit, pin, some flowers and 3 lengths of trims. 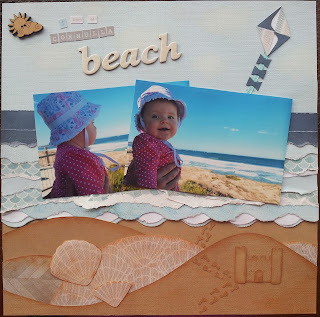 Unfortunately the page doesn't seem to photograph well... Form these papers I couldn't go past beach photos and lucky for me Chloe had just been to Cornulla Beach for the first time just days ago. 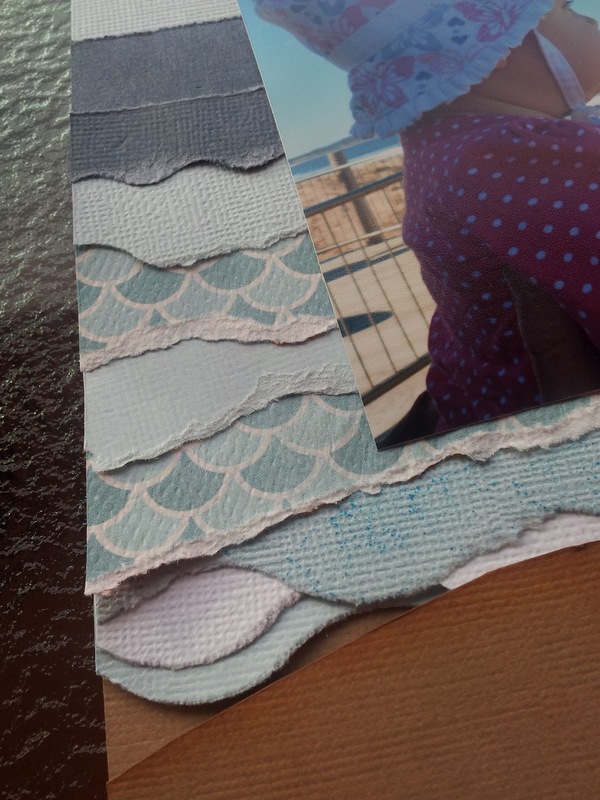 I split the page into three sections, the sand, the water and the sky. A did a spot of paper piecing and inking in this layout. 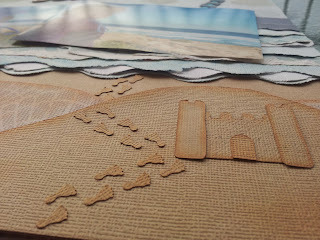 The sand section has a paper pieced sand castle and tiny foot prints which came from a boarder punch I have in anticipation of Chloe learning to walk. All the bits in this section are inked around the edges so that they can be seen and to give dimension. 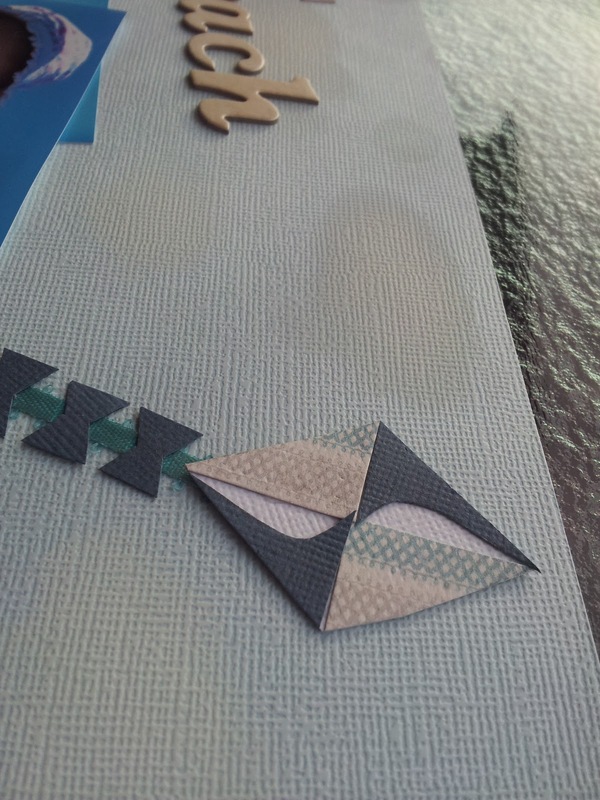 The sky section features a paper pieced kite using the ribbon and white ink blotches to add subtle clouds, I did try tearing some of the white cardstock but made them stand out too much. The sky also has the title in it, I wish I had positioned the letters differently but they stick quick. The water section was created by layering pieces of torn paper trying to give it waves and dimension. It was almost a shame to tear up these papers but it exposed the white core to add to the wave effect. Do you like it? Let me know and come back tomorrow to see another layout using this great pack.